Last week, I attended a wonderful symposium in Yarnton Manor, Oxford on “Orthodox Judaism and Theology in the 21st Century”. I thank Miri Freud B Kandel (Oxford) and Adam Ferziger (Bar Ilan University) for all their wonderful work organizing the delightful conference which included an intimate Shabbat for the participants. I will have several blog posts about the conference. The session in which I spoke “Orthodox Judaism and the Bible” consisted of Joshua Berman “Jeremy Bentham and the Modern Perception of Contradiction in Biblical Law,” Alan Brill, Orthodoxies confront Biblical Criticism: Must Orthodox be Orthodox?, Tamar Ross, Orthodoxy and the Challenge of Biblical Criticism, and James Kugel was the respondent to our papers. The core of Berman’s paper was already posted on this blog, and I will post mine in upcoming weeks, the core conclusion of which is that: Yes, one must be Orthodox and that Louis Jacobs was closer to Reform thinkers in his theology by the 1970’s. In the response to our papers, Kugel stressed how should not preclude that God can actually talk and that we should not use Biblical criticism for theologies. The positions that Kugel explained during the weekend was not the same as the position that many ascribe to him. When Shabbat was over and the others were eating the melavah malka buffet, I sat down in another room with Kugel for a conversation about his opinions and to explain the Orthodox community to him. I recorded some of his points to which Kugel kindly responded with greater detail. The bold print is my echoes of what he said to which he replied in writing. The Jewish approach, the Rabbinic approach,is one of Torah min Hashamyim as an ongoing process of explaining, reworking, and interpreting the text. Dear Alan—thanks for all of this, and please excuse all my fussy diyyukim below. Well, the Jewish approach is certainly Torah min ha-Shamayim, but saying it’s an “ongoing process” might mislead people. For me, Torah min ha-Shamayim is the belief that the Torah was given to Israel by G-d, period. I wouldn’t want to seem to say by this that the text of our Torah was given over a period of centuries or anything like that—just that it is all of divine origin. I also said that no modern biblical critic that I know of has ever suggested that scholarship can prove or disprove the divine origin of the Torah: this is a matter of belief. The Torah consists of words, and there is no litmus test that can determine that this word came from G-d while that word was inserted by Moses (or someone else). Words are words are words. Even if someone could point to contradictions within the Torah, or apparently unnecessary repetitions, or signs of later editing or interpolation—none of this has any bearing on the Torah’s divine origin: after all, who makes up the rules of what a divine text can or cannot consist of? This may sound like an apologetic approach, but when you think about it, it’s just the simple truth: who are we to determine what or how G-d can put in His book, or how it can arrive in our hands? The phrase “Torah mi-Sinai” is entirely different: it refers to a particular place, Mt. Sinai, and implies a particular time and person, Moshe at the time of Ma’amad Sinai. A modern scholar can certainly take issue with this doctrine (and lots of them do). I myself have never done so; never. Frankly, I don’t believe that doing so is consistent with being a religious Jew. (Of course, I reported in my book about the whole development of the Documentary Hypothesis, and I know that some readers took this as an endorsement of it—but that’s because they misunderstood, or never got to, the basic argument of that book—on which see more below.) I would say, however, that Torah mi-Sinai and Torah min ha-Shamayim exist on two completely different planes and are not, therefore, of equal importance. Torah min ha-Shamayim is what counts. As Hazal said, anyone who says the whole Torah comes from G-d except for this one pasuk, which Moshe wrote on his own—such a person is a blasphemer who dishonors the Torah. I meant: “Jews do not study the biblical text alone, in isolation,” because for us the Torah is not, and never was, just the Torah’s own words on the page, but it was those words plus the interpretations and explanations of the Torah she-be’al peh that constituted the Torah’s true meaning. I’d put it this way: I have said from time to time (somewhat whimsically) that it might have been better if, instead of printing Humash with Rashi, publishers had started out printing Humash with Yalkut Shim’oni, since, unlike Rashi’s commentary (which, for all sorts of laudable reasons, sought to eliminate any inconsistencies between one midrash and another and therefore made a specific kind of selection of various midrashim), Yalkut Shim’oni preserves that kind of tentative, and strikingly modest, character of midrash: “It could be this, but on the other hand, here’s another explanation.” What bothers me is that nowadays people learn Rashi as if it simply is what the text means; it is the Torah. Among other things, I don’t think this is good pedagogically. It works fine with third-graders. But by the time they get to high school, most of them know Hebrew pretty well, and they know that those Hebrew words in the pasuk don’t mean what Rashi says they mean. So how can Rashi be the Torah? At this point, the best of them develop a new interest in biology or social studies, because limmudei kodesh don’t seem to fit with their notion of the truth. Kugel accepts Torah from Sinai through Moshe as a historic event but more important is that Torah from Heaven in the continuous reading of meaning in the text. It’s what I said above about Torah min ha-Shamayim being the crucial matter. I could not, and would not want to, be part of a religion that claimed that Torah was a human creation, or that it is, as I’ve heard some people say, “a human reaction to the ineffable divine.” At the same time, though, I think it is a basic principle of Yahadut that what starts in heaven is inevitably given over to human beings. “Lo ba-shamayim hi” means “the Torah is no longer in Heaven.” It started out there, but then it was given to our sages to adjudicate. Rather than cite the much-cited Oven of Akhnai story or any of the others, I’d mention a matter close to my own area of research, the calendar. There was this great calendar that some Jews used in Second Temple times: it worked automatically on the basis of the solar year—30-day months with an extra 5 or 6 days added to keep pace with the sun, hence no need for witnesses to go to Beit Yaazek and testify before the beit din that they had seen the new moon, no need to intercalate a whole month at irregular intervals,, and the hagim were never, as we say, “early this year” or “late this year,” because they were basically in sync with the sun. Was this calendar not a better representation of the passage of time than the calendar of Hazal? After all, it was G-d who set the sun in the sky and it was that solar year that had to be followed if Pesah was to occur in the spring and Sukkot in the fall; why play around with lunar months and all the difficulties they entailed? (If you read the words of the Torah alone, there is no indication that the months it speaks of are lunar months, dependent on sightings of the new moon.) But Hazal gloried in the idea that the sacred calendar was NOT automatic, that it required human beings as witnesses and a beit din to interrogate them (“Hakhazek ra’ita o khazeh—did it look like this, or did it look like that?”). And they made sure to stress the point by having us say the berakhah “mekaddesh yisrael ve-rashei hodashim” which means: You gave us the authority to determine the calendar, having us establish not only when each new month starts, but also when all the holy days within it occur, hence “mekaddesh yisrael ve-ha-zemenaim,” and even “mekaddesh yisrael ve-yom ha-kippurim.” This is a striking instance of the principle, “Lo ba-shamayim hi,” what starts in Heaven is given over to humans to interpret and apply. Biblical scholarship and Biblical criticism is fundamentally a Protestant endeavor and antithetical to the Jewish approach. Absolutely. The whole Protestant movement began with the rejection of interpretive traditions or anything like our Torah she-be’al peh: the only thing that mattered was the Bible’s own words, or, as they said, “Sola Scriptura,” by Scripture alone. That’s why biblical criticism began as, and still largely remains, a Protestant undertaking, still pursued for the most part in Protestant centers like Germany, Scandinavia, England, Holland, the U.S. and Canada—and, for various easily discerned reasons, in modern Israel as well. The title “How to Read the Bible” as explained in my introduction was to show two radically different approaches to how to read the Bible. I’m sure some people were misled by this title (despite what I think I made clear in the preface). I know some people even thought—in spite of everything I wrote in the preface, the introduction, and the final chapter—that I was recommending that people adopt the conclusions of modern biblical scholars as the way to read the Bible. That was actually the opposite of my message. Don’t get me wrong: some of these modern scholars were nothing short of brilliant readers and thinkers. But they all approached the job of reading the Bible from the Protestant assumptions that I have described—which were quite at odds with the assumptions that had always accompanied the reading of the Bible in an earlier age. It might have helped some readers to know something about the work I have done as a professor. I suppose that many of them just assumed that I have spent my life writing about, and contributing to, modern biblical criticism. Actually, almost all of my previous books and articles (starting in 1982) have been about ancient biblical interpretation, things in the Dead Sea Scrolls and the sefarim hitzonim (the book of Jubilees, Ben Sira, etc.). Among those books: Ancient Biblical Interpretation (1986), In Potiphar’s House (1990), The Bible As It Was (1997), Traditions of the Bible (1998), The Ladder of Jacob (2006), and A Walk Through Jubilees (2012). I’m sure that almost anyone who knew my previous research could not misconstrue the message of How to Read the Bible: it is all about the role of ancient biblical interpretation in determining the meaning of the biblical text, a role that had existed long before the elements of the Torah she-be-‘al-peh first began to be committed to writing at the end of the second century C.E. Protestants are basically concerned with the text itself and all that modern scholars now know about the historical and other circumstances connected to it. Jews, by contrast, are concerned with the text as it has always been interpreted in the Torah she-be’al peh, which is often at odds with the literal meaning of the Torah’s own words. Actually, I knew both these scholars and admired them. But I do think that they were chasing a phantom, a synthesis of traditional Judaism and biblical criticism. The very basis of such a synthesis is incompatible with Jewish tradition. This approach just assumed that biblical criticism was, or could be made to be, compatible with traditional Judaism: and the solution and integration was just around the corner. But somehow, it never materialized. It never could because biblical criticism is concerned with the literal meaning of the Bible’s words on the page, divorced from Judaism’s age-old traditions of interpretation. That is to say, Jews and Protestants can’t even agree on what the text is. For Protestants, it’s the words on the page, sometimes supplemented with archaeological or historical data gleaned from excavations in the Middle East. These data are certainly interesting, in fact, fascinating—but they don’t have anything to do with Torah in the classical Jewish sense. This critique also applies to Orthodox Bible scholars who think they can teach philological peshat and the Near East context as part of an overall Jewish approach. Creating derashot that mix midrash and Mesopotamian elements in the text is a kind of sha’atnez that must ultimately be unfaithful to either approach, and usually ends up censoring out of each anything that might call into question their combination. It’s just a kind feel-good operation. Lots of people like this feel-good stuff, including lots of Orthodox Jews. I didn’t like it because it seemed too general. Rosenzweig was basically a trained philosopher, so rejecting his approach might mean almost anything (philosophers trying to make sense of Judaism, his ideas about Bible translation, etc. ); Louis Jacobs… my sense so far is that it’s more a matter of his conclusions than his approach (I’m not sure there’s anything distinctive about his approach). Kugel does not like Bible as literature. I don’t like the “Bible as Literature” approach primarily because it’s another feel-good operation, designed to get us to appreciate what Norman Mailer once called (sarcastically) “the great novelist in the Lord.” We don’t honor Scripture above all other writings because it’s the most beautiful or artistic; that’s Islam. The Torah is our most sacred book, divrei Elokim hayyim; it’s not about literary excellence. What’s more, the “Bible as Literature” approach is often unconvincing: it finds great artistry where it wants and overlooks anything in the text that might counter this conclusion. He accepts the entire text as Torah min Hashamayim and therefore rejects any approach that minimizes God’s role. It is certainly not illogical to believe that God can communicate with human beings, as some have suggested: This is the whole idea of prophecy, and without it Judaism cannot be said to exist. Do you limit God’s activity to only inspiration of the Biblical authors or a vague inspiration of God’s will? As I’m sure you know,inspiration is a very tricky term for modern theologians, Jews and Christians as well: for some them, it isn”t something less than actual divine speech, so I”d rather leave that term out of the discussion entirely. But I’d be happy to reword what I wrote in blunter form and say: I believe that God does speak to man; this is the whole principle of prophecy, and without it Judaism cannot be said to exist. His field is ancient interpretation of the text, not modern Biblical criticism. He is surprised that people think he is a Biblical critic or that he works in that field or made any contribution to that field. He has not. On the other hand, he thinks Orthodox Jews should learn to live with Biblical criticism the way they have learned to live with such things as Darwinian evolution or modern astrophysics. I think it is best to deal with modern biblical scholarship not by hiding from it, but by understanding that its underpinnings are based on a conception of Scripture that is altogether alien to Judaism and, frankly, to everything other scholars and I have discovered about the very idea of Scripture as found in the Dead Sea Scrolls and other ancient texts. He cannot account for the emblem he has become. None of what I’ve said in the above is new: it’s all in the last chapter of How to Read the Bible, as well as in earlier works such as The Bible As It Was and In Potiphar’s House. Nor, frankly, have I said any of the above to find favor in the eyes of my critics, Teaneck or otherwise. If they want a Bad Guy—well, I’m sorry if it has to be me; I don’t think anyone likes the idea of being disliked. On the other hand, the things I’ve said here, and in my book, are really pretty straightforward. If some people are of such a nature as to willfully distort what I’ve said above and in my books, well, I’m not sure I’d want to convert them into allies even if I could. Let them seek out the company of others, Orthodox Jews who would rather hide their heads in the sand than even acknowledge that modern biblical scholarship exists, or else the feel-good people who try to make everything work out by a selective reckoning with the evidence. In the end, I don’t think either of these approaches can succeed. On the other hand, I do believe that in fifty or a hundred years, a lot of Orthodox Jews will wonder what all the shouting was about; modern biblical scholarship, like Darwinian evolution or astrophysics, will just have receded into the background. Who knows, maybe some will even understand what I have been saying about the difference between the very idea of Torah in Judaism and the quite different, Protestant conception of Scripture underlying the whole enterprise of modern biblical scholarship. By the last quarter of this hour discussion, we had gathered a small group of listeners who started to participate in the last round of questions. In the discussion of Kugel’s being singled out, the listeners started to point out the lack of education in the community. How many in the community think the words of the Talmud were from Sinai, how they think there is direct causal reward for mizvah observance and observe Judaism out of fear, how they accept outreach arguments like the kuzari proof. How they approach Torah text with mechanical literalism, even when do the new approaches of Bible as literature. The discussion turned to how Orthodox pick up Kugel’s book and think that he is preaching the Enlightenment critiques of religion, which are certainly more readily available elsewhere than his book. The fact that Orthodox, even modern ones, read his book and hear about common academic ideas for a first time is not to be laid at his feet. Kugel has little interest in addressing or correcting the low level readers of his book lacking a good humanities education. He did not realize that not just high school students but most of the community including leaders, authors, Bible teachers, and high school Jewish studies teachers lack his requisite erudition. He was more than shocked at the lack of basic exposure in the Orthodox community to historical thinking and critical studies. He will be publishing a sequel to his introductory work On Being a Jew where he will discuss Biblical criticism and Judaism but none of the content of this interview. He does not think it is needed and if it is,then it is not his audience. This is not my final post about Kugel’s work. I still seek to process in my mind: his giving preference to Jubilees and Wisdom of Solomon over Rabbinics, his method of treating everything as eisegesis without problems to be solved, and his Spartan view of not seeing the poetics and values that can still be found within and in comparison to Mesopotamian texts. Most of all, I need to recheck his writings and see if they were as free of ambiguity as he claimed. If you comment, please reread the rules for comments and remember the discussion is the contents and topic of the interview not outreach arguments or your opinion of academia. This Wednesday, January 30, 2013– 7:30 p.m. If you are an academic and want to join for dinner, then contact me off line. I will also be selling my last two books for $43 and $49 respectively. 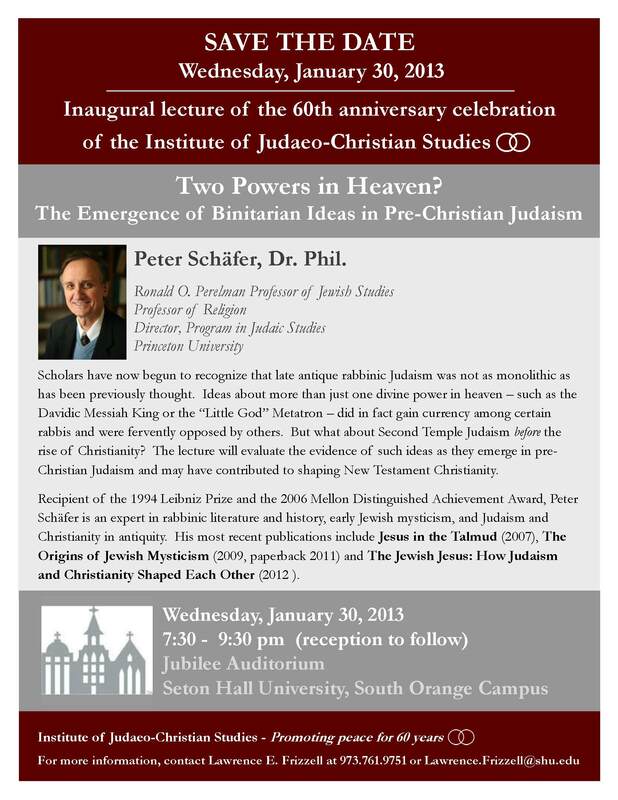 Peter Schäfer is currently the Ronald O. Perelman Professor of Jewish Studies and Professor of Religion at Princeton University, as well as the Director of Princeton’s Program in Judaic Studies. Before this he served for 25 years as Professor of Jewish Studies and Director of the Institute of Judaism at the Free University of Berlin. He held positions as Visiting Professor at Oxford, Hebrew University and Yale University. In 1994, Dr. Schäfer was awarded the Leibniz Prize, the highest award for German scholars, and in 2006 he received the Andrew W. Mellon Distinguished Achievement Award. Dr. Schäfer has published extensively about rabbinic literature and history, early Jewish mysticism, and Judaism and Christianity in antiquity. He edited the corpus of Hekhalot literature, the Talmud Yerushalmi and (with Sh. Shaked) magical texts from the Cairo Geniza. His most recent books are Jesus in the Talmud (2007), The Origins of Jewish Mysticism (2009, paperback 2011) and The Jewish Jesus: How Judaism and Christianity Shaped Each Other (2012).